If it had been unseasonably chilly or overcast in Las Vegas last July, Panic at the Disco fans might not now be thoroughly enjoying or loudly complaining about the sophomore album from the Sin City pop-rock quartet. Happy, singing clouds; shiny, robust suns; and beguiling female-identified moons - not to mention various winds, stars, and weather vanes - appear so often in the lyrics of "Pretty.Odd" you begin to wonder if the band is obsessed with meteorology. "We spent a lot of time outside when we were writing the record," admits lead singer Brendon Urie of the recurring big-sky motif. "We wrote it in the hottest month of the year in Las Vegas. We had a weird sleeping schedule, too. We pretty much stayed up all night and slept during the day just because it is so hot there. So we spent a lot of time looking at the stars and enjoying and experiencing the weather so I think that had a very direct influence on us." You hear that influence in the smiley-face boppiness that pervades even the most melancholy of the album's 15 tracks, which the band will play Sunday at the Bank of America Pavilion. The joy that Urie, guitarist Ryan Ross, drummer Spencer Smith, and bassist Jon Walker felt while writing and recording their symphony to influences like the Beatles, the Beach Boys, and the Zombies practically leaps out of every filigreed horn part, snappy backbeat, and stacked harmony. Fans are divided by this turn of events. The message boards are aflame with those who long for a return to the anguished, carnival-barker emo of Panic's double-platinum 2005 debut, "A Fever You Can't Sweat Out." Others are loving the newly psychedelic left turn in which meticulously layered songs like first single, "Nine in the Afternoon," and "Northern Downpour" combine trippy imagery and dreamy melodies that pay homage without naked, outright theft. Enough are loving it that "Pretty.Odd" debuted in the top 10 and has already sold more than 200,000 copies. Of course, even if the boys have ditched the top hats for puffy blouses, the changes in the musical landscape aren't as uniformly drastic as some are making them out to be. The quartet - which shares writing duties, with Ross contributing the lion's share of lyrics - hasn't lost its affection for old-timey vaudeville sounds. Witness the ukulele swing of "I Have Friends in Holy Spaces" or the cutting and sarcastic remarks. On "She Had the World," Urie sings of a discarded lover: "I'm sure I didn't ruin her, I just made her more interesting." "People think we had some point where we said, 'Guys, we've got to slow down because this is going to throw people away from us,' " says Urie on the phone from New York, fresh from an appearance on MTV's "TRL." "We were having such a good time writing that we figured that there's no way you couldn't have a good time bopping around to it. But if not, then oh well. "We took into account that we had to play these songs for the next couple of years live, so we didn't want to get sick of them. We didn't expect or intend to alienate anybody. We just wanted to make a fun record." And they wanted to do it the old-fashioned way: playing live together in one room, recording on tape, and eschewing devices to correct pitch. Enter producer Rob Mathes, who, in addition to producing and writing the string and horn arrangements, also played a half-dozen instruments, serving as a kind of "fifth Beatle." "A combination of George Martin and Billy Preston," he says with a laugh. Mathes, who has worked with everyone from Ghostface Killah to Michael Bolton, says watching the youthful band - whose members are all in their early 20s - discover and rediscover some of his classic favorites was a treat. "The thing that's charming about Panic's love for the Beatles is that they're not liking the stuff I dug. They're listening to weird stuff," he says, pointing to obscure tracks from "Anthology." "The Beatles don't scare them. They think they discovered 'Yellow Submarine.' We are talking about the Shakespeare of pop! It's 'King Lear' and 'Hamlet,' and yes, it scares us all, but to Panic, they want to put on their own little production of 'King Lear.' 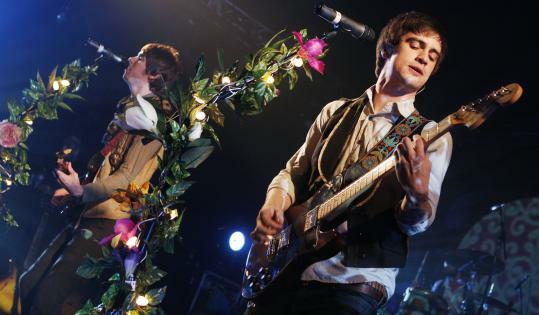 "
Interestingly, the critical response to "Pretty.Odd" has been generally positive, but the band has taken some flack for its backward-looking ways. "With an older generation, there's some weight carried with the Beatles," says Urie. "There's almost like an untouchable, god-like force field around them. With us being younger and a little more ignorant, it's just, 'Hey, this is new music; why can't we be into this?' It's just a totally different view on it. I think it's healthy for bands to discover new, older stuff," he says. And what if the winds in Las Vegas had blown a different way? "I guess I never really thought about it," he says with a laugh. "But I'm sure if the weather was really horrible, [the new album] might've sounded different. It definitely needed to be what it was for us to write those songs."